News from Cabarceno: My baby was given the name Duni! Spanish farmers chose names with the help of children. The female gets its official name to mark the annual birthday. Popular gorilla Moja, who traveled in order to start their own families in Spanish Cabarceno, April 16, 2013 she gave birth to her first cub. Small female celebrate for a few days of their first birthday and gets on that occasion, the official name! "The name helped us collect children. In the period March 15 to 30 we give them the space available in the Visitor's chairs and tables and give them a list of names svahilských for males and females. 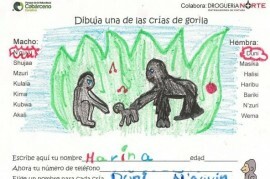 Children created drawings associated with the gorillas as these names, "says Eduardo Vejo, coordinator of the Education Department Cabárceno Park." Winning names for our two young gorilla then selected breeders. " My first-born cub of Prague, almost a year a female, was named Duni. Younger male Chelewy then N'guvu name. According to Spanish colleagues Duni is very active and independent - runs after exposure and collects your vegetables, climbs the ropes at heights. My female still occasionally rides on the back, borrow it and two other females in the group, especially Chelewa, which is due to learned to properly take care of your baby. Father of two Niky behaves like a proper silverback male. With peace and tolerance oversees minor skirmishes between females and affects them only when a situation will mount. The local gorilla family consists of six lowland gorillas: My addition, Chelewy, two pups and a male Nikyho also thirty-three female Nadia. Easter differently? Try exploding cars in Italy or spectacular alpine fires in Austria.